Now I understand why people are so disillusioned with our politicians here, they don't have an online store… with puns! 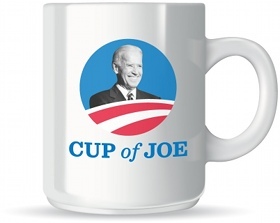 Cup of Joe — Start your day right with a fresh Cup of Joe, featuring the Vice President’s bright smile. Made in the USA. Older post → Witnessing NASA #Curiosity #MSL launch, from bed!